These are lyrics by Tommy Roe that we think are kind of repetitive. 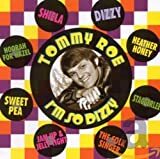 Tommy Roe's, "Hooray For Hazel"
The phrase "Hooray for Hazel" appears four times in each chorus, one time in each verse, and at least 20 times in the entire song. Tommy Roe's, "Money Is My Pay"
The line "Money is my pay" appears four times in each chorus and more than a dozen times in the song.